Greetings from Torch Trinity Center for Education & Ministry. All the students have been working hard from the beginning of the semester, and now, spring has arrived! The cherry blossoms are ready to burst their buds! 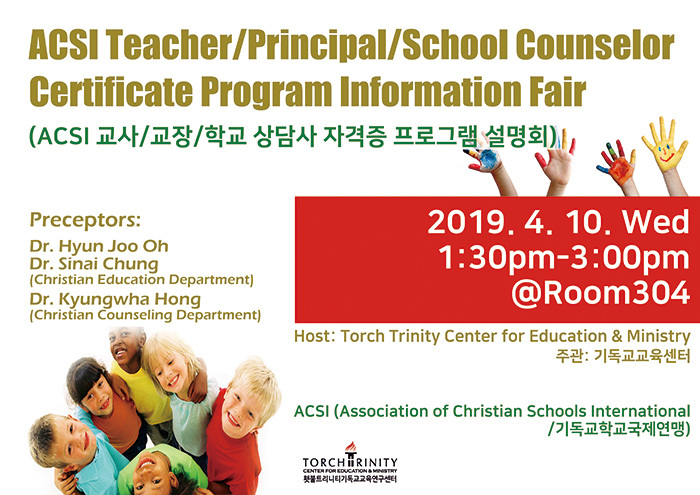 At this season, TTCEM is going to hold information fair about ACSI Teacher/Principal/School Counselor Certificate Program on 1:30-3:00 pm, April 10 (Wed), 2019 at Torch Trinity Room 304 (See the poster attached). Please do come and know about ACSI (Association of Christian Schools International) Teacher/Principal/School Counselor Certificate Program. Certainly this fair will present you valuable information that you might need for your future ministry. If you have any question about the ACSI certificate program or the registration process, please feel free to contact So Hyun Lee by ttcem@ttgu.ac.kr or 82-2-570-7565. 안녕하세요? 봄이 성큼 다가오고 있습니다. 꽃의 계절, 횃불트리니티 기독교교육센터 주관으로 ACSI 교사/교장/학교 상담사 자격증 프로그램 설명회를 열게 되었습니다. 일시는 4월 10일(수) 오후 1:30~3:00이며, 장소는 강의동 304호입니다 (상세 사항은 첨부한 포스터 참조). ACSI 교사/교장/학교 상담사 자격증 프로그램 설명회는 국내 및 해외 선교지에서 각양의 모습으로 사역하실 여러분의 미래 사역을 위한 귀한 정보가 될 것입니다. 관심 있으신 횃불트리니티의 모든 재학생은 오셔서 참여하시고 정보도 공유하시기 바랍니다. ACSI 자격증 취득이나 등록 과정에 대해 질문이 있으시면 이소현 조교(ttcem@ttgu.ac.kr 혹은 82-2-570-7565)에게 연락 주시기 바랍니다.